UNITED NATIONS, April 15 -- Days after the UN refused to answer if Secretary General Ban Ki-moon met with Rosa Otunbayeva before she replaced President Bakiyev as ruler of Kyrgyzstan, then referred only to a meeting by Ban's political advisor Lynn Pascoe, Inner City Press learned that Ban attended two meeting with Ms. Otunbayeva, before Bakiyev's overthrow. Sources told Inner City Press that Ban attended two meetings, one closed and an open one with parliamentarians, at which Otunbayeva spoke to him. While Ban did not do a projected media availability on April 15 after he briefed the Security Council on his Central Asia trip, Inner City Press caught up with Lynn Pascoe in his wake. Inner City Press asked Pascoe to confirm or deny that Ban met twice with Otunbayeva. To his credit, Pascoe confirmed it. There were three things, he said. The first, the S-G with parties, opposition parties, Rosa Otunbayeva spoke. And then with the parliament. In the first, she raised the question of opposition folks who were demonstrating. The S-G said, I'm going to be taking meetings, I have Pascoe. So I did it. Ban's associate spokesperson Farhan Haq, when Inner City Press asked in writing if Ban had met Otunbeyeva, said he would not comment on the new leader. Then when Inner City Press asked Martin Nesirky, Ban's spokesman, Nesirky mentioned only the Pascoe meeting. He used the word "singular," which no longer makes sense: there was more than one opposition leader met with, and more than one meeting, even with Ban. On April 12, Inner City Press asked for a "readout on what opposition leaders did the UN delegation meet with while in Kyrgyzstan?" Spokesperson Nesirky: I think it is singular rather than plural, and it was Ms. Otunbayeva. This was a meeting with about half a dozen representatives, mostly journalists and including Ms. Otunbayeva. This took place during the Secretary-General’s visit. The Secretary-General was in other meetings, and he asked Mr. Pascoe and a number of other advisers who were travelling in that delegation to Central Asia to meet with them and they were then able to report to the Secretary-General on the conversation. 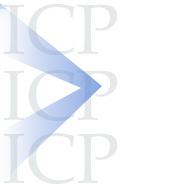 Inner City Press: Did they make any predictions? Or is it possible to get kind of a readout of what was discussed at the meeting? Spokesperson: No, I do not think it is possible to have a readout of that meeting in itself, because that goes beyond normal diplomatic practice. Inner City Press asked Pascoe about this on April 15, that his meeting was with "mostly journalists." Pascoe said, "I saw that and I cringed a little bit, there were several opposition figures." To some it appears that the UN is playing down -- to put it diplomatically -- Secretary General Ban Ki-moon's pre-overthrow meetings with opposition leader Rosa Otunbayeva. But why? Some point to the obvious double standards of having denounced the ouster of President Zelaya from Honduras and the leader of Niger, but not this. On that, we will continue to report. Watch this site. Footnote: the split between Pascoe and the UN spokespeople is highlighted, not to discourage Pascoe from saying what happened, but to encourage the spokespeople to. 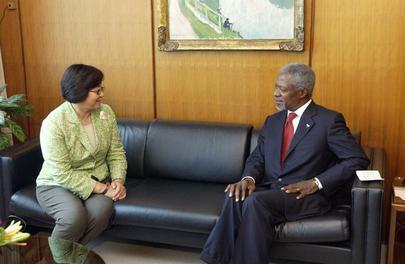 UN's Pascoe Met with Kyrgyz Otunbayeva Days Before Bakiyev Ouster, Johnny Appleseed? UNITED NATIONS, April 12 -- When the UN's Ban Ki-moon was in Kyrgyzstan last week, just before the violent overthrow of President Kurmanbek Bakiyev, his top political advisor met with a single opposition figure: former UN staff member Roza Otunbayeva, days before she took over Bakiyev's place as a de facto head of state a/k/a coup leader. Last week Inner City Press reported, then exclusively, that Ms. Otunbayeva had worked for the UN from 2002 to 2004 in Georgia. Inner City Press asked Mr. Ban's spokespeople if Ban "or his staff had any communications with her prior or subsequent to the fall of the Baliev Government yesterday?" Ban's associate spokesman Farhan Haq replied archly, "I wouldn't comment on the leadership in Kyrgyzstan while Jan Kubis prepares his visit. I can confirm that Rosa Otunbayeva had been Deputy SRSG for UNOMIG from 2002 to 2004. " But over the weekend, sources told Inner City Press that Ban's head of Political Affairs, B. Lynn Pascoe, had met with opposition figures including Ms. Otunbayeva. Some suggested, perhaps tongue in cheek, that Mr. Ban had belatedly become something of a Johnny Appleseed of revolutions, in this case one which Russia also supported. And so at the next noon briefing on April 12, Inner City Press asked Ban's spokesman Martin Nesirky about the meeting with Ms. Otunbayeva, which (other) opposition figures the UN met with. Video here, from Minute 9:50. "I think it's singular rather than plural," Nesirky said, "and it was Ms. Otunbayeva." 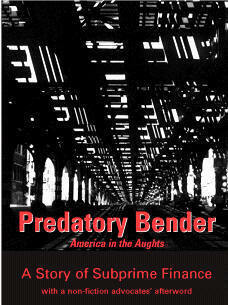 He alluded to a "half dozen representatives, mostly journalists, including Ms. Otunbayeva." But what was the purpose of the meeting? Was Ms. Otunbayeva a journalist? "The S-G," Nesirky continued, was in other meetings and so asked Mr. Pascoe and others in the delegation to do the meeting and report back. Who else was in the meeting: now UN envoy Jan Kubis? 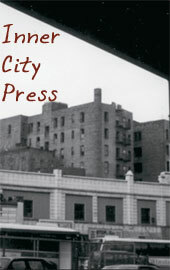 Inner City Press asked for a read out on the pre-revolution meeting, but Nesirky declined. "I don't think that's possible, that goes beyond normal diplomatic practice." 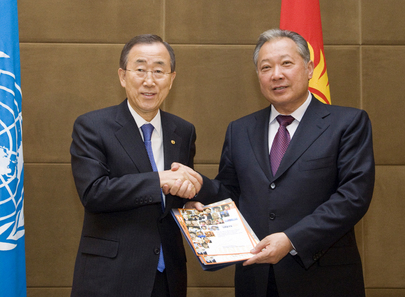 UN's Ban with Bakiyev on April 3- as Pascoe met Ms. Otunbayeva? So what did the top political advisor for Mr. Ban -- or should be call him Johnny Appleseed? -- discuss with Ms. Otunbayeva? Footnote: moments later in front of the UN Security Council, Inner City Press asked this month's Council president Yukio Takasu of Japan about the call by Bakiyev for the UN to send peacekeepers to Kyrgyzstan. Video here, from Minute 4:07. Ambassador Takasu said he and Council member are "obviously aware of the report" but the Council and S-G have not received "official notification." Could it be a bit difficult to send an official letter from Kyrgyzstan right now? Watch this site. UNITED NATIONS, April 8 -- With the world temporarily focused on or at least looking at Kyrgyzstan, much of the focus has been on new "interim" leader Rosa Otunbayeva. One salient fact, however, has been missed: Rosa Otunbayeva has worked for the UN, in Georgia, from 2002 to 2004. UNOMIG deputy head Roza Otunbayeva said she hoped that both sides would still make an attempt to give concessions in order to advance the talks, and she pledged continued support from the United Nations. "The U.N. will do everything possible to create conditions conducive to trust and constructive work," she said (Kuchuberia, ITAR-Tass). The new [interim] leader of Kyrgyzstan is a former senior UN official, having served as the Deputy and Acting SRSG in UNOMIG during the previous SG's tenure. Does the Secretary-General believe that the new leader is someone he can work with, given her UN credentials? "Concerning Kyrgyzstan, as the SG announced, Jan Kubis will travel there tomorrow as his special envoy. We will await his travel and meetings as we evaluate the situation in the country; we wouldn't have any comment on the leadership there at present." 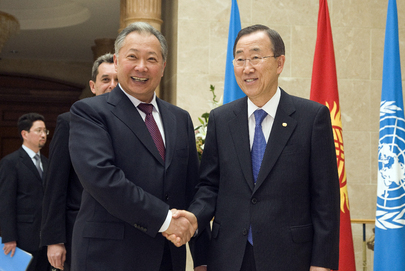 "to the Kyrgyz question, can the UN confirm that the current 'interim' leader of Kyrgyzstan is a former Acting UNSRSG? And has the current SG or his staff had any communications with her prior or subsequent to the fall of the Baliev Government yesterday?" Bear in mind that close observers say that Ms. Otunbayeva was chosen as interim leader due to her "international connections." " I wouldn't comment on the leadership in Kyrgyzstan while Jan Kubis prepares his visit. I can confirm that Rosa Otunbayeva had been Deputy SRSG for UNOMIG from 2002 to 2004. " What magic, then, can possible next UN Secretary General Jan Kubis perform in Kyrgyzstan? Watch this site.